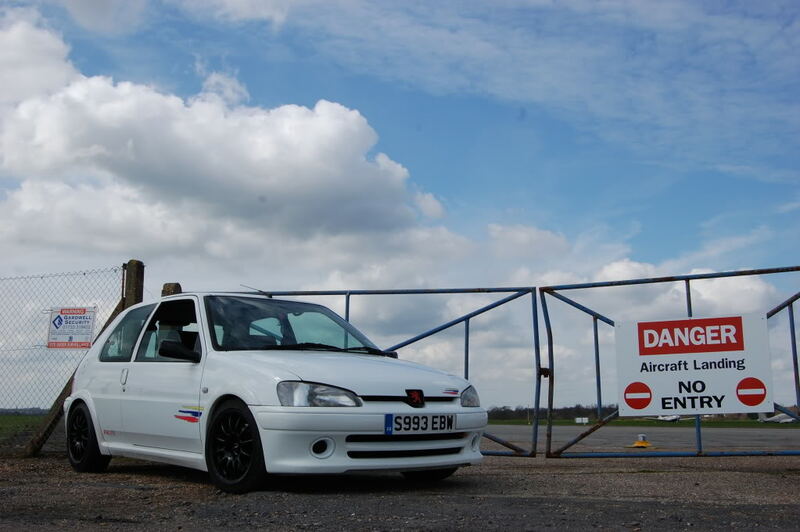 Im selling my 106 Rallye due to wanting an upgrade..
Its been very well looked after since Ive had it (For 10 months) and also before me. Plenty of receipts before I owned it. 1998 S2 Bianca white 106 Rallye. Shell is on 99k currently. 50k JP4 Engine from a 307 fitted 3k ago with full j4 head internals. BMC Induction with a cold air feed. S2 Rallye Gearbox fully rebuilt with new syncro rings and diff bearings by Mankee Cheng. Rebuilt less than 100 miles ago. New clutch kit with the gearbox. Raceland 4-2-1 Stainless Manifold was brand new with the engine. 250 Mile old Lambda sensor. Gaz coilover kit (4 Adjustable dampers and front struts converted for the coilover setup) fitted less than 8k ago. Brand new top mounts fitted with the coilovers. 266mm 206 Gti brake conversion. 2 new drop links fitted with coilovers. Rear beam lowered to match the coilovers. Black Team Dynamic 1.2 Alloys with 4 Toyo Proxi T1-R's with around 4mm of tread left each. Standard S2 bodywork in very good condition apart from a small scuff on the rear bump strip, although its not really noticeable. Up rated front door speakers. Odessy Race battery relocated into the boot. Id say the car is in very good condition inside and out. Just had it in a very reputable rolling road and it made 140.7bhp with a graph to prove..
Any Questions, your welcome to ask. is this stil for sale mate??? as long as has PAS..
Nah sorry mate he's sold this couple of weeks ago but it was an awesome car. can be a faff to convert sumtimes..
and yea ther was quite a few that were sold with it..
and no worries mate, not suprised has sold, looks stunning..
did it stay local do you know? Have mine for 3k lol!